From 27th to 31st March, Bilbao Exhibition Centre will become an international showcase for the naval, port, fisheries and energy sectors thanks to the WORLD MARITIME WEEK. With specific conference programmes and high level networking for each of the four sectors as well as joint areas and activities, such as the opening plenary session, exhibition area, gala dinner and prize-giving ceremony, the encounter will maintain the specialisation of each field using their own trademarks. Therefore, SINAVAL will focus on the naval sector, EUROFISHING on the fisheries sector, MARINE ENERGY WEEK, which is organised by EVE, Tecnalia, Azti and BEC and is sponsored by Iberdrola, will focus on offshore renewable energies, particularly offshore wind power and tidal power, and FUTUREPORT, which is back after its commercial use in 2009, will concentrate on ports. Whilst the first day of the programme, Monday 27th, will be devoted to private meetings, and the last day, Friday 31st, will include visits to the facilities of the exhibiting companies, the central block of the agenda will concentrate on conferences, workshops, exhibition area, posters, B2B meetings and social acts. In the conference section, experts from different countries will analyse themes related to the Environment, Oil and Gas, Trading and Bunkering, Tuna Freezing Vessels, Infrastructures and Equipment for a More Sustainable Maritime and Port Industry, International Port Authority Extension Projects, Offshore Wind Power, Maritime Law or Ocean Energy. The networking space for direct contact with other professionals from the Maritime Industry will be one of the distinctive features of the WORLD MARITIME WEEK. 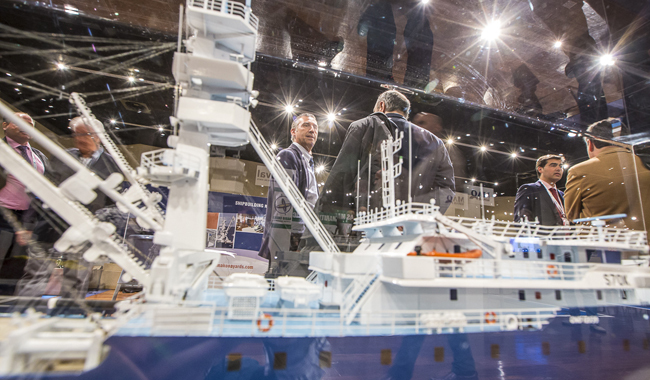 At SINAVAL, Meet the Buyer will organise B2B meetings between exhibitors and shipowners and shipyards from the Philippines, Malaysia, Singapore, Indonesia, Thailand, Germany, Greece, Denmark, United Kingdom and Ireland, as defined in the initial programme design. EUROFISHING will offer meetings between owners of tuna freezing vessels and fishing ministers from different African countries of prime interest. MARINE ENERGY WEEK will also offer exclusive meetings and FUTUREPORT will coordinate interviews with international port authorities. To design the contents of the programme, define the profile of the participants and consider strategic lines, the organisers of the WORLD MARITIME WEEK have set up Working Groups for each of the sectors, in which the most important companies and institutions in the maritime field have been holding diverse meetings.